I encourage you today to take the lead in life and begin to practice practical things every day that will strengthen that leader in you! A couple of things that I would encourage you to do get you started is, first, look people in the eye when you’re speaking to them. There is a level of confidence displayed when you are direct in eye contact. Also, dress the way that you would like to be addressed! You attract what you portray. If you look like you woke up in the morning, caring and meaning business, carefully orchestrated and meaningful business is coming your way. 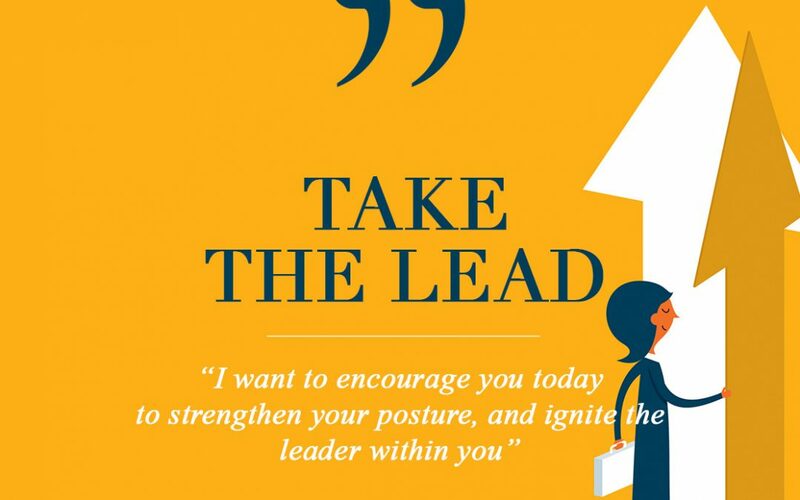 What are some things that you do to ignite the leader within you? Let’s talk! Thanks for this word on today. This has been my goal for this year to step up in areas of my life and go after some things that I have been sitting on and be the leader that God has called me to be and do. I have started with my schooling and plan to start in April once everything is completed and also set my ten goals to accomplish this year and tracking to ensure I don’t lose focus. Thanks for having this venue to share with women to go and grow. Your time is not in vain but making a impact on our lives. Great word of encouragement this morning Dr. DeeDee Freeman. Thank you so much for caring more than enough!! Thank you for the motivation and the encouragement. I appreciate you! This really blessed me. I need to step up in all that God has called me to do. You are a Jewel to the body of Christ. I’m looking forward to meeting you at GGG. Thank you for your obedience to God. Love ❤️ you my sister in Christ. Please angry with me for my marriage to be reconciled. I ment agree with me concerning my marriage. As always, I love your words of encouragement. I feel like I am being called to do something with/for the Youth of my church. We no longer have a youth ministry and I have noticed that we have been dwindling on the youth in our church. I have also noticed that the youth who are still in our church (including my children) do not have many activities or things to keep them involved and empowered. I have been thinking about this for the last month or so and feel like God may be calling me to do something and your word on this morning has confirmed that. I have also been thinking about returning to school for my Master’s degree but I’m not sure if that’s me or God. LOL! I have enough money I already owe in student loans but I feel that I need to go back or I may just want to go back. Please pray for my strength, wisdom and discernment when it comes to this. Thank you again Ms. DeeDee for your words of encouragement. I am glad that I started following you. Amen, Dr.Deedee this my thought just last week have to embrace what God has called me to do , Thank you for Having a ear to hear Holyspirit And a heart to rely it over in such a special away! Thank You Dr. Freeman for the word today!! I needed to see that and receive it! I’m encouraged today, Dr. Dee Dee! Thank you! Shout out to my First Lady and spiritual Mother in love. Missed you. This message really blesses me!! I receive it!! I look forward to your nuggets and blog weekly. I really appreciate it. Thank you for your heart!! Wow! A great message Dr.DeeDee,thank you so much for the encouragement..for that push to be the Best that we can be in life,to do what God has already given us the strength to do anything we want to do…Its up to us to do it!💙💙👏Thank you. Thank you Dr. Dee Dee! Your words of encouragement strengthen me and give me something to hold on to when life seem to be a little confusing or unsettling. I know I was born to be a leader and I’m determined to take the necessary steps to obtain my God given position as a leader in the workforce.Thank you giving me the motivation to start today. I began daily using the bible app. It helps me to track how much time and devotion I’ve given. So when the enemy tries to say that I haven’t been consistent and shame me..I got proof! Lol It also helps me to pull it out and look over a verse wherever I go, in line, waiting to pick up my kids, etc. I have also began to be more consistent with leading my children spiritually and not leaving it all to the church. We 🙏 on the way to school and 🙏 & complete a devotional at night more than ever before. Thank you for always motivating and encouraging me to do better. You are such a great blessing to the body of Christ and women worldwide. Thanks so much for that God given word today. I try to be the leader by talking with kindness and showing kindness. And look at the great example before me that you Dr Dee Dee. Thank God for you and Pastor Michael. Love you all. Hi Dr. DeeDee! Thanks for sharing that timely word. I so enjoyed it and receive what you have spoken. I also enjoyed the VLOG that you just posted, that was nice, mixing it up a little from just print to a video. Way to go on that one! Thanks again for sharing. Thank you for this wonderful encouragement today!!! And welcome back from your trip!!!! Thank you for our Monday’s together, always an on time word. Looking forward to July GGG. There you go again Dr Dee Dee pushing me and challenging me. This why I love you so much. Back to the drawing board I go with some larger goals. It really is easier to sit back but your right God has called us to step up to plate and lead. Praise God! Dr. Dee Dee thank you so much for this. I have begun to take a leadership role along side my husband. He is not a pastor he is a deacon. And because he has been stepping it up in his role and in the word as a deacon I see God working with him but with me also. I am a retired teacher who had a leadership role in the public school system as a Lead teacher but God is raising me up in the ministry now. I needed to hear this. My husband has been encouraging me and we have been ministering to our family and in the community with the homeless; giving to them, ministering to them, and encouraging them. God is moving us in a new direction together which is a blessing. He is showing us how to work in the church as well as outside of the church and how they are really one in Christ. I praise God for what He is doing in our lives. But this blog today really has hit home. Keep them coming. Thank you for wisdom. Be Blessed. Thank you for encouraging me to lead! Every now and then, even those currently leading need encouragement!! Awesome! I am stepping up to take my rightful place because I am a leader. Thanks for the encouragement, Mom! Just spoke to some young ladies in my church on yesterday about this very topic! Sadly, sometimes the adults that the youth looked up to are not good role models in the way they dress or carry themselves. Thank you for this confirmation ! I’m moving! I’m moving! I’m moving! Your life is such a blessing and road map!! Just like the landscape of the earth God created, with many twist and turns, hills and valleys but at the end of it all it does lead somewhere. The landscape of our lives can sometimes take on that same form but God, the designer and creator of the landscape has a destined end for us to lead to. There is a leader in me, God placed it there but unearthing the leader in me feels like the fight of my life. I am in a stagnate place, complacent which makes me frustrated and uncomfortable because I know there is more and I need to be doing more with what God has placed in me. I have been contemplating going back to school. Funny when I started college years ago my goal was to get my PhD but after finishing under graduated I was like I need a break. That has been 20+ years… I have been contemplating going back but I just don’t want to get loans and I feel like I am not discipline enough like I use to be. Oh well, as always your blogs are very inspiring. I have been getting signs every where… go back to school. Much Love!!! Thank you for the encouragement, Leadership is the path that life is going into right now. Not something that I asked for it just happen! Practice prepares you to receive your promise. Thank you so much for that extra push. I needed to hear your message today. We must keep pushing out of our comfort. You are awesome!!! I love your blogs, the always inspiring message and you and your fabulous self! I thank God for you and the word you give. It’s always on time. Too often many powerful women are adviced to dumb it down instead of walking in the leadership role God will have us to. Thank you for encouraging us to continue to pursue all God has for us even in leadership. True leaders do know followship also. Thank you so much Dr. Dee Dee this was life changing for me, and it has reconfirmed the season that I am in. You are such a blessing thanks for the encouraging words of wisdom God Bless & hugs!! Writing ,but not sure if u even reply to comments: Dr. Freeman, my name is Melissa. I have been married 19 yrs to my husband and we have 3 teenage boys. My oldest son plays basketball for a local high school.He is a Senior this year and will be graduating in May. He is a Christian and this year has been the worst attack on him spiritually. He has stood alone from his teammates, feeling rejected, b/c he doesn’t party and hangout with them. Can u give me any tips to help build up my son thru this time? Amen, I receive. I will take my rightful place in the Kingdom of God as a Leader. Very much encouraged,thank you,needed to hear this. You are ALLWAYS encouraging. Thanks for your example. Thank you for this. For 15 years I taught a professional development claas. Ive heard leadershio training. Please and thank tou goes a long way. Ask oeople their name & tgen use. Remember that if you change someone’s name (by not pronouncing it correctly or not asking how to pronounce it), you change their identity. Some other things is to speak, when you enter the room. Good morning or a simple hello. Acknowledge those that are there. A firm handshake is also important….none of those “scared-to-touch- you wimpy-flaky handshakes. Be firm but strong-armed & look at the person as you greet them. And if you gonna hug, hug with conviction, purpose & intention. Enter the room as though you belong….because you do! I apologize for the typos. It should read: I have taught professional development classes on the college level & have had leadership training. Please and thank you goes a long way. Ask people their name. Thank you Pastor Dee Dee, I thank God for sending that word of encouragement to me through you. You are such an awesome woman of God and a woman of wisdom and grace. I very much appreciate the challenge Dr. Dee Dee. I graduated in June 2016 from a Leadership Excellence in Acquisitions (LEAP) Program. I’m executing the principles gained by which are not always received. Nevertheless, I must keep moving. You a so awesome. Just when I was going to give up and walk away. This blog and you book has changed my life. I met you in target in Waldorf and I just love your spirit. Trying to come to the conference because I would love to meet you again. Praying that God keep you around for me. * Respond willing to the calling of being a leader — Once upon of time I really enjoyed being scenes at least that is what I have been telling myself for years but now I feel unappreciated and taken for granted. I am not sure if those feeling are really something else. Is it a push to do something different or greater? I am the elder of my family which naturally lends itself to leading not only I am I the oldest of my siblings. I am a wife, mom, mother in law, grand ma, and as a professional I am called upon to lead as well. Most of the time I hold back my gifts because for so long I had to prove I was capable and worthy of every praise or any accomplishment I’ve achieved. I am a very blessed women who stands flat-footed in my RIGHT and AUTHORITY to lead and be the BEST ME that I can BE! I will not apologize anymore. With that being shared I will happily RESPOND! WOW! How did you know? I am in this now out of a place of quietness, shy, saying oh, not me it must be someone else – leadership?? I joined toastmasters and terrified to speak through an entire speech yet I am sticking to it. There is a calling in spirit to move into this role but, not sure – I want to overcome this fear. Your message is right on time – has hit the spot- OK I’m going to stay through the outcome. Thank you. Thank you for the confirmation and encouragement all wrapped up in this video! I appreciate your loving and caring spirit! Wow!thank you for those words of edification it truly has blessed me to take a leap of faith toward the things of God that he has called me to do. The one thing I am going to do is write out a plan of action and begin to move on what I believe God has gifted me to so. Thank you again Dr. Deedee for your blog! Truly a blessing to me. I am a leader. Leader manifest yourself, in Jesus name. Thanks for sharing. It really caused me to embrace and recognize the leadership ability God has placed on me Be blessed. Thank you for the vlog today!!! It was good to see AND hear you! 😊I am taking the lead! You spoke to me when you said it’s not that I’m not qualified, it’s the recognition of what’s on my life by me first and then by others. Recently, I’ve been taking action, doing things out of my normal comfort zone and it’s been surprisingly good. I posted my first public YouTube video about 2 weeks ago, a major step for me because I’ve considered myself shy. But amazingly, I received an email stating someone subscribed to my channel!!!! What?!? !😃 Then I looked and saw that that short video I recorded just to share with my husband had received over 160 views!!! !😂 That encouraged and inspired me to upload another. So here I stand with an audience of people I’ve never met, but to whom God has assigned me to speak to. That is just amazing to me. I also asked one of my podcast mentors, Dan Miller of the 48 Days Radio Podcast to play a recording of me singing after he read my success story on his internationally listened to show, AND HE DID!!! So I’m taking the lead by taking action and it is great! !Thank you again for all your encouragement!!! Awesome Karen!!! Very encouraging. Much Success to you!!! Thank you Dr. Dee Dee for that awesome word. Thank you Dr. Deedee for this word. Thank you for being a willing vessel to Our Father, you are a beautiful model for the kingdom and I am so grateful for you and your love, support , and encouragement. Timely word yes for me.See you at the conference GGG2017. Thank you for the confirmation from this post. During my time with Holy Spirit this morning this was inspired for me to do, a 90day Empower me, to strengthen, refresh and upgrade every area of my life. Again thank you. This a very good word. I like what you said about looking people straight in the eye when talking to them. It does show that a person has confident. This blessed my socks off. Thank you for your transparency, integrity, godly character as a Pastor, Leader, Wife, Mother and grandmother. Thank you. Something I do, which you have taught me and is to know that everyone is important and therefore be in the moment. This shows leadership because I can lean a listening ear, encouragement and or advice and not feel threatened by that person or in competition. I’m not to busy. Leaders displaying that others are important are true bosses. I receive that! I have been talking to God lately about people not knowing and seeing the “real” me. But I have met the real me, as Pastor Mike said we would. And I am ready to lead. Thank you, Dr. Dee Dee for being such an inspiration and a role model. Good morning Dr. DeeDee Freeman, I really needed this message today. I need to talk to people eye to eye for them to know I mean business. I like how you said dres the way I would want to be addressed! That is very powerful for me because some days when my spirit is down I will dress the way my spirit is feeling and I need to dress the way I want to be addressed!! Thank you! Please continue to speak into the lifes of some many women. Such good/true words of encouragement. Just what I needed to start my day. I am committed to help those who are in need, spread the word of God. Mainly bring a smile to anyone I meet along the way. Always a timely word – thanks so much Dr. Dee Dee for the encouraging word for us ladies!! Thank you for the encouraging words. As a teacher and team leader it is important to look and dress the way you want to be perceive. You are correct that sometimes we are overlooked and in this case considered the minority. But thank God this year has been a blessing where my administrators and co-workers are respecting and thanking me for my integrity and being someone whom they trust, admire, and respect. God bless you for all that you do for us as women in the ministry, our homes, and communities. I truly appreciate YOU!!! Thank you for encouraging us and reminding us to see ourselves as leaders. God has qualified us to see ourselves as His hand extended in the earth. We are told to call those things that be not into being. If we don’t see ourselves as leaders start decreeing it. I am blessed by your ministry. One thing I’ve been focusing on is my speech. I notice that people are always paying attention to what to you say when you don’t feel as though you’re saying anything. In those moments that I feel I’m saying something, I’ll be better heard if my speech was appropriate when I didn’t feel I was saying anything. I realize we have to earn the right to speak into a person’s life. I definitely agree that appearance means a lot. I use to not take time to be a little more “well put together” and would just go basic. Now i add make-up, jewelry, and try to make even a $5 outfit look like $500. It definitely matters. I’m still growing in this area and daily I’m building confidence and demanding the respect I know I’m due without being arrogant or demanding. Thank you for always encouraging and being transparent. We need each other to survive. I am grateful for your leadership. Morning Dr. DeeDee. I have watched you over the last 14 years on the word network. I’m just reading this blog today on my bday, but it was an appointed time. I am a hairstylist as well and my life just shifted from NJ to Ga. I’ve been asking the Lord about how I’m to transition. It’s been difficult to go from a business owner to a stay home mom and wife after the grind of the chair life. Today I’m blessed to know that I can rise with confidence knowing that there is still yet a leader in me. My husband and children are a blessing to me. I thought I was to old to go back to school but wow you just encouraged me that it’s not to late. Thank you for being a marvelous light for women in and out of ministry. I’ve always desired to attend the GGGC. This is the year I step into a newness. Thank you for always trending in the Lord. Hi Dr. Dee Dee, congrats on going back to school for your Doctorate. I thought of myself as a leader and then I constantly doubt myself. I know I am not operating in faith which is what you and Pastor Mike teach all the time. I have to get better. I do have a mindset for leadership — I just need to have more confident in myself. I appreciate you more than you’re ever know. You have been such a blessing to my life and the numerous others. Hugs and love! Dr. Deedee, thank you so much for sharing this. As I started listening, I was learning forward, but during the middle of this video, I had to sit back and really take this in. This video was an encouraging word!